Building a app is critical process , Having helped build more than a hundred apps from categories ranging from social networking, utility, entertainment and lifestyle, I get asked a lot of questions by entrepreneurs and businesses on the entire process of building and marketing apps. Lay out the flow and features. Validation of your app idea means that you’ve got something that people want to use. Now is the time to detail your product onto a document, or if you want to go the extra mile, use a wireframing tool. Remove non-core features-From the flow and features document you prepared, start looking closely at features that you can remove. Offer only the core value of your app idea. Do not build features in the first version that are “nice to have” and can always be added later as an update. This will help keep the initial costs of development down and also help you get to market quicker. Put design – I have heard many entrepreneurs saying they want a very basic design and want to focus on just developing an app. They are so wrong! Design is not just about how your app looks, but it’s about how a user will experience the app. Vinod Khosla of Khosla Ventures best explains it: “Design is a way of making technology useful.” So look for a developer who puts design (user experience and graphics) first. Integrate analytics- Analytics help you track downloads, user engagement and retention for your mobile app. Make sure you use tools such as Flurry, which is available for free, and Localytics, that has a free and paid version. Get feedback quickly and improvise-Once your app goes live on the app store, the first set of customers’ usage and behavior will give you insight into how to improve and enhance your app. Enhancements and changes are constant, so keep an eye on user feedback and keep building. 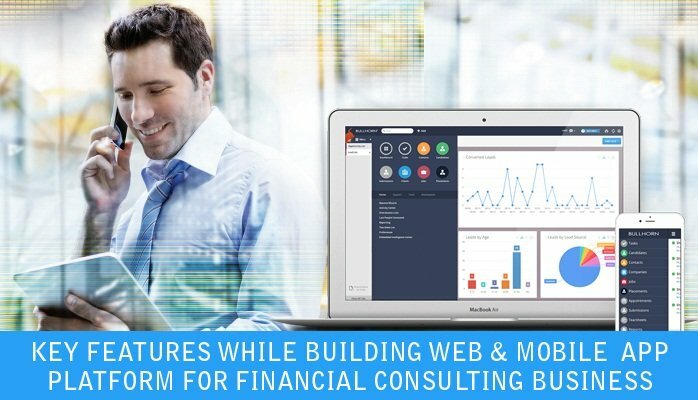 For more information to know about key features of web and mobile app for Financial Consulting business,do drop an email at info@oditeksolutions.com.